At Windward Vein, Heart and Medispa, we specialize in affordable, state-of-the-art and minimally invasive vein treatments at our outpatient treatment center in Kailua, Oahu. All treatments are performed or directly supervised by board-certified physician Dr. Sonny J. H. Wong, FACC. Dr. Wong has over thirty years of experience and can offer personalized recommendations for your vein treatment needs. Windward Vein, Heart and Medispa’s state-of-the-art vein center offers a variety of vein treatments to address all vein and circulation issues. We provide treatment for both simple and highly complex venous disorders including spider veins, varicose veins, hand veins, facial spider veins and prominent breast veins. Our main objective is to offer virtually painless treatments without compromising our patient’s lifestyles. We do this through giving focused, individualized and comprehensive care that is effective and seamlessly integrated into your everyday activities. The root cause is usually a damaged or weakened valve within the vein that causes blood to pool in the legs. Veins can become weak over time because the blood coming from our lower extremities must work against gravity to return to the heart, and sometimes blood that is supposed to go to the heart leaks downward into the veins. Over time, this leaked blood forms varicose veins and spider veins. Up to 55 percent of women and 45 percent of men suffer from some type of venous disease. Many factors can raise your predisposition to varicose and spider veins, including genetics, body type and pregnancy. It’s important to remember that we can prevent the onset of spider and varicose veins by being active and taking care of our bodies. How do Veins Become Weak? The heart works by pumping blood out to the entire body via our arteries. Opposite the arteries, veins return blood from the body that flows back to the heart. Because our heart is located in the upper portion of the body, blood coming from the lower extremities must work against gravity to return to the heart. Blood must return to the heart constantly to pick up oxygen and repeat the cycle. Luckily, our veins have one-way valves that prevent blood from rushing back down the legs (the medical term for this is venous reflux). After the muscles in the legs push the blood up towards the heart, the valves act like locked doors that shut when blood is in front of them so preventing the blood from dropping back down the leg. Problems typically arise when the valves in the veins malfunction. When this occurs, blood that is supposed to be making its way up to the heart leaks backward down into the vein. Over time the leaked blood pools and becomes congested, leading to dilated veins causing varicose veins to form. 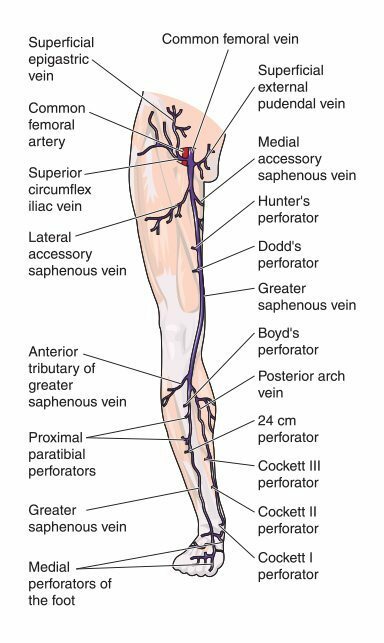 Spider veins are similar to varicose veins in many ways; the main difference is the size and appearance of the veins. While varicose veins are often dilated or bulging, spider veins are usually smaller and resemble spider webs from which they get their name. Though many theories exist as to why valves malfunction, doctors tend to agree that age, genetics, obesity, pregnancy, and sun exposure are some of the leading causes of varicose and/or spider veins. It’s important to remember that we can prevent the onset of spider and varicose veins by becoming active and taking care of our bodies, despite the inevitable aging process. is recommended for individuals looking to alleviate the pain associated with enlarged varicose veins. This procedure scars the vein so that it closes and the blood cannot flow backward and pool. Instead, the blood is diverted back to the heart, through the deep venous system where it can flow properly and not from the surface veins that eventually will varicose. is the new “super glue” treatment for varicose veins that requires no heating from laser therapy or any added sclerosing medications to be inserted into the vein. A hardening adhesive is applied directly into the diseased vein and closes the vein. is a procedure that requires only a small 2-3 mm incision in the skin, to extract the diseased vein. A vein hook is then used to remove the unsightly vein that can become painful if left untreated. It is done with local anesthetic. Compression hose are the first level of treatment we start with at Windward Vein since they can prevent the early stages of varicose and spider veins from developing further. They are an added support system for weakened veins that take on extra blood volume when the deep veins become insufficient to hold any pooling blood. Compression hose come in different strengths to help support these superficial veins, as though there is muscle tissue to help control the stretching and bulging. Since compression hose come in a variety of strengths, you should only wear them as your doctor prescribes. To have your compression hose prescribed by Dr. Wong, and to schedule your complimentary consultation, please call Windward Vein today. Dr. Wong and his team will assess the severity of your veins and recommend treatment options that will provide the greatest chance of success for you. At Windward Vein, your long-term treatment is our priority—we offer the least disruptive options to help you get back to normal activity right after the procedure. If you’re experiencing pain from the presence of varicose or spider veins, call Windward Vein at 808.261.2441 or request your appointment today. A beautiful and confident future awaits.